Shruti Laya cordially invites you to the celebration of Thyagaraja Aradhana, on Saturday, Feb.12, 2011 at the PS 115 auditorium. The program will begin at 10:00 AM Sharp with the traditional group singing of the Pancharatna Krithis. (Please note the time change, this was necessary to accommodate the prior commitments of some of the artists). All Children and Adults, singers and instrumentalists, who know one or more of the krithis are invited to join in the group singing to pay homage to the Saint. No registration is necessary, but please be at the auditorium by 9:50 at the latest, so we can begin on time. We will start with Sri Ganapathini followed by the five Pancharatna Krithis. Just as we did last year, we will follow the Cleveland version of the krithis. Since there will be no time for group rehearsals, please visit http://www.aradhana.org/panch.html to listen to these and practice on your own. 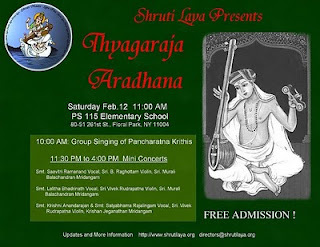 This will be followed by three one hour thematic mini concerts of Thyagaraja songs by area music teachers and artists. The program is completely free, and we invite you to grace the occasion with family and friends. Please plan your day so that you can enjoy the full program. Lunch items, Coffee, Tea and snacks will be available for purchase at nominal rates. Shruti Laya needs your support to continue to bring you the best of Classical Music and Dance. We have great programs planned for 2011: Concerts by Shashank (Flute), Abhishek Raghuram, O.S Thiagarajan, a grand dance performance by Shijith & Parvathy Nambiar and many more are being planned. Membership in Shruti Laya is a great bargain, and comes with free admission to four concerts (but not the dance).